It was a cool, windy October Saturday in Hershey, Pennsylvania, but that didn’t stop thousands of little girls dressed up in their “Elsa” and “Anna” dresses, along with their families from standing outside the Giant Center. They were waiting anxiously to see their favorite characters take the ice in Disney on Ice presents “Frozen”. Inside the arena, the cast of the show is taking the few moments they have to relax before putting on their costumes and preparing to entertain those fans for their second show of the day. 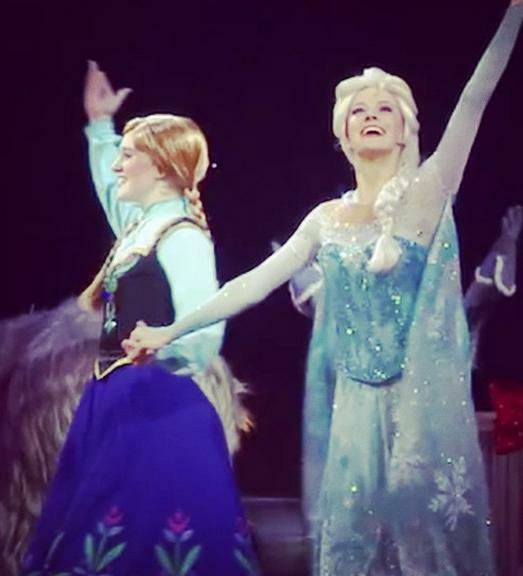 Disney on Ice presents “Frozen” has become one of the hottest tickets across the nation. According to Forbes Magazine, “Frozen” is the most successful Disney On Ice in history. The tour sold over 700,000 tickets in its first week and 250,000 in its first day. Shows have been selling out, more cities and shows have been added to handle the demand. Seeing those crowds day after day, city after city is something Becky Bereswill has not gotten tired of yet. This summer, Bereswill was cast as “Elsa” in the show. For people not familiar with the Disney movie, “Elsa” is the Queen of Arendelle, who has special powers to produce ice, frost and snow. 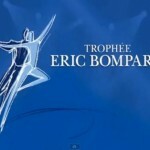 So it did not come as a surprise when Feld Entertainment, the producers of Disney on Ice, created a traveling ice show dedicated to the popular movie. The show follows the same story that millions of children and adults have grown to love. It also uses the movie’s soundtrack, with the songs like, “Let It Go” and “Do You Want to Build a Snowman?”, songs that have become so catchy that kids and adults can’t help but sing along. The audience is even encouraged to sing along as the cast performs. Telling the story of “Frozen” is Bereswill’s favorite part of being a part of this show. The show is also very relatable for Bereswill as it tells the story of the bond between two sisters, “Elsa” and “Anna”. “Anna” is played by Taylor Firth, who skated competitively for 15 years before joining Disney on Ice. Bereswill knows what it is like to be a sister. 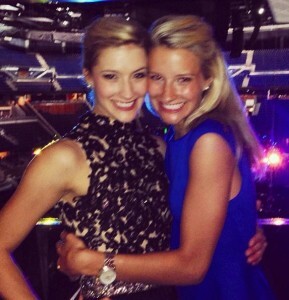 She has an identical twin sister, Allison, who was also a figure skater. Just like millions of children, Bereswill has seen the movie a lot. Before she started rehearsing for the show, she said she saw the movie, start to finish, eight times. Now, since rehearsing and performing in the show, she has re-watched certain scenes over and over again that she has seen the movie more than 50 times. The cast is consistently referring back to the scenes and the story. By the end of the tour, Bereswill will have performed this show more than 400 times. Performing show after show, day after day, you think Bereswill would be tired of hearing those songs, but that is not the case. Before becoming “Elsa”, Bereswill saw success on competitive ice. The Houston native started skating when she was seven years old. She competed both nationally and internationally for the United States. At the junior level, she was the 2008 Junior Grand Prix Champion. Bereswill also tried her hand in pair skating, competing with Trevor Young. In 2011, Bereswill and Young finished in 10th place at the U.S. Championships. They ended their partnership shortly after. Bereswill would then compete in the 2012 U.S. Figure Skating Collegiate Championships, where she finished in third and the 2013 U.S Championships where she finished in 16th place. While no longer competing, the 24-year-old is now enjoying the performance aspect of her skating. When she is not on the ice, Bereswill is working on getting her college degree. She is a senior at the University of Michigan and this summer, she completed an internship at Goldman Sachs as a summer analyst in New York City. Right now, she is putting off her last semester to take part in the tour. So what is next for Bereswill after she puts her special powers away and hangs up “Elsa’s tiara”? She isn’t sure. She is just joining every moment of being apart of this tour. 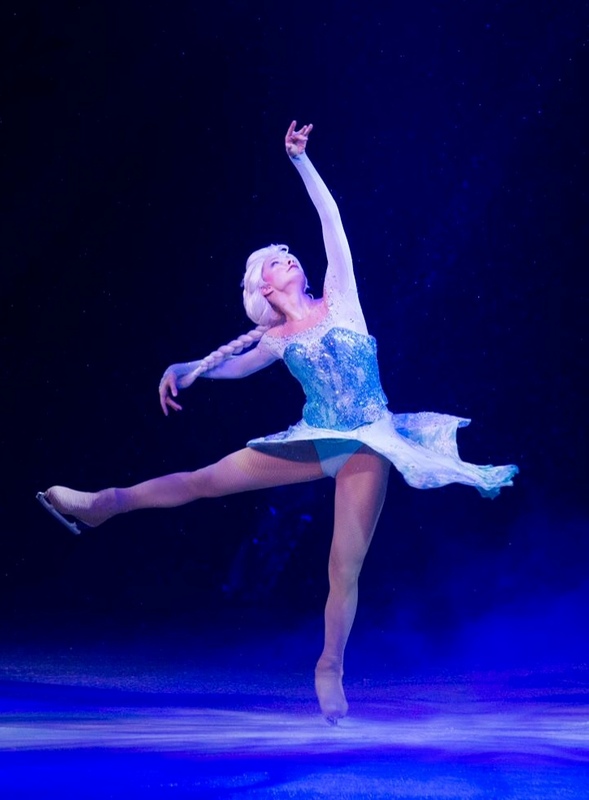 Don’t miss out on Disney on Ice’s presents “Frozen” on tour. Here is a list of tour dates. For more information on the show, click here. To learn more about Becky Bereswill, check out her official website hosted by Figure Skaters Online. 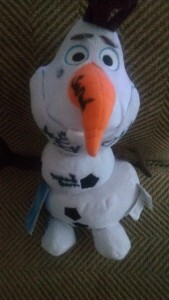 How would you like to win a signed Olaf from the cast of Disney on Ice presents “Frozen”? It is even signed by Becky Bereswill! “Like Figure Skaters Online on Facebook” for more information. Our contest will be held in December 2014.